Shops in Tenerife are subject to change. But how? Shops in Tenerife are somehow different from those in most of western countries. Many have managed to cling to past values, such as small sizes with individual service and good customer care, contrary to some self service outlets. Quite a few of them have survived in old tourist hubs so far until 2012, above all in prime locations. 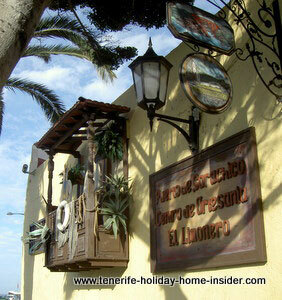 However now, you will look in vain for some of the shops in Tenerife which are a little off the beaten track. Garachico is one such place. Those which don't have prime location have a hard time. The streets Calle Estebán de Ponte 11 and Avda. Tomeé Cano are good examples for Garachico shop changes. Only Artesanias El Limonero Garachico with its souvenirs, arts and crafts seems to be left, as it is also accessible from the beach promenade, as shown beside. Almost next door is the shop called Tabacos Arturo. It sells Tenerife cigars. Both retail outlets have a life size, folklore mannequin outside which draws in tourists. That's a charming touch of marketing, indeed. A ceramics' shop called Ceramica with rainbow colored crafts replaced the art gallery Garachico Arte and Diseño. (art and design) The gallery used to be in no 5, of C/ Estebán, also. Now, it remains only in the Internet, to the best of my knowledge. At least, its owners were wise enough to give it more exposure by a proper homepage. A young couple in their Fifties from Nürnberg Germany who just bought an apartment in my house started the topic. They are delighted with them, as there are non left in their home country. They said the big supermarkets can be tricky. How? They often lure us with cheap offers and put up prices very much later. This didn't happen at the legendary Fruteria M Carmen of the Longuera nor with the little shop next to it. Today, I bought hot Chilly Powder called Pimenton as well as sweet Pepper Paprica there. It comes lose out of a huge glass jar and has to go onto the scale. But only Euro 15 /a kg each. You will never find it at that price in big stores. Of course, not everything is cheap at the tiny convenience shops. However, we also save on petrol when we shop there. And the tiny retail busines is so good for the little old people in my neighborhood. By the way, there are none left in Germany to the best of my knowledge. I noticed that foreigners opened up some mini shops in the UK, to serve special communities., though. El Kilo in La Longuera uses its shop now only for storage and window display. But locals will go to the outlet in Realejos Alto. Why? They say El Kilo sells fabric articles and the like they won't find anywhereelse. Interesting, isn't it? Closed down shops in Tenerife also remind me El Gusano Alegre of Santa Cruz which was one of the handsome ones in the capital. Now, it seems to be on Facebook only. It may sell its jolly antique dolls houses to its faithful old customers. But is that enough nowadays? Its language which is Spanish restricts it somehow to start with. Lets look at romantic Garachico again. 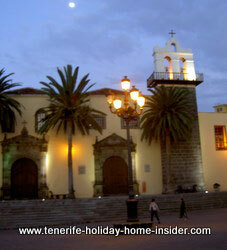 A dream scene of its central town square with a subtle Tenerife nightlife and moon is portrayed beside. Talking of romance, don't miss one of the most beautiful Tenerife hotels, right there. It's the Quinta Roja Garachico which even has totally free Internet in its most godeous, comfortable patio. By the way, no shops are on that peaceful town square, but only a cafe pavillon with edible kiosk goodies. I still have to find out, where the shopping galleries from 2007 besides the crafts haven El Limonero Garachico have gone. By the way in 2001 and 2007, drastic changes of our times were unimaginable for Tenerife shopping Garachico. From shops in Tenerife back to shopping in Tenerife for Alcampo, Carrefour, Ikea, Corte Ingles, Lidl, Spanish fashion Zara, Piramides Martianez, shopping with photos Arona, Leroy Merlin best buy shop, electronics, markets and much more.